Scott Benefield set up Benefield Spencer Glass in Northern Ireland. He is an artist working with glass and has a string of international academic fellowships and residencies to his name. 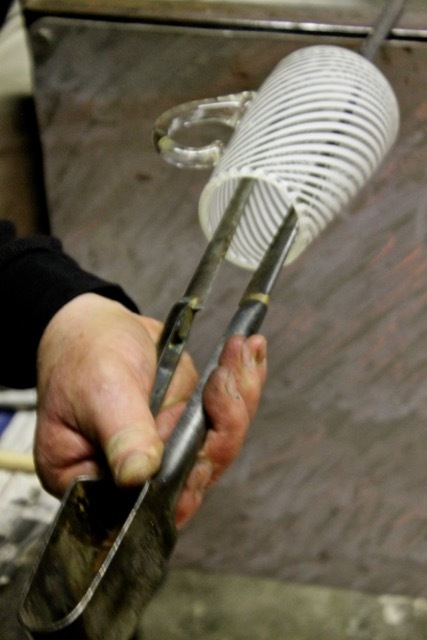 Everything that gives the final object its form or decoration happens at elevated temperatures, emphasising the fluid nature of glass and the glassblower’s skill. There is no engraving or painting or reshaping afterwards. The entire object is created in real-time and as such is a record of the reactions and decision-making that occur in a split second as the material moves. Using the same tools and conditions, fire and gravity, that have shaped glass for two millennia, Scott’s designs ensure that traditional craftsmanship and 20th century Modernism find a meeting point.